The Puyallup Fair is a legendary thing in the Seattle area. There's something for everyone: rides, games, animal shows, and--most interesting to me--plenty of fair food. Famous foods from this century-old fair include the Fisher Scone, Ice Cream Dip, and of course corn dogs and burgers (you know, to keep the sweets company). Today marked my first ever visit to the fair--on the last day of its 2011 run. I got to taste the famous scones, of course. At $1.25 a pop, these sweet, biscuity, butter-and-jam filled treats are decidedly exquisite among the usual fair fare (which is generally more iconic than it is delicious, if we're going to be honest). However, that's not to say that fair food isn't fun. 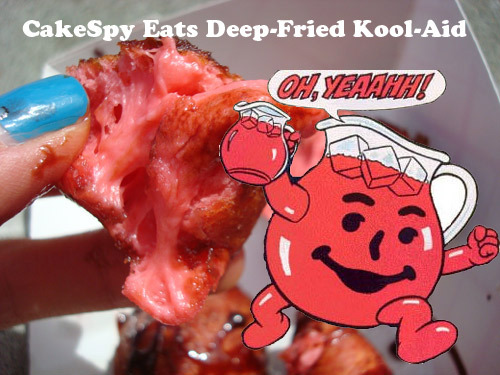 And to honor that, I also sampled something from the "Totally Fried" booth. Sadly, they were out of my first two choices, Deep-fried Bubblegum and Deep-Fried Butter--but happily, they DID have Deep-Fried Kool-Aid. 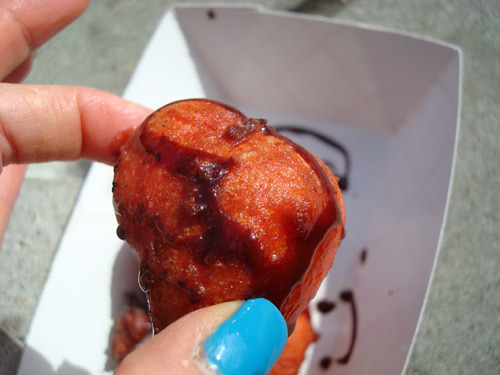 It was gummy, it was tangy, it was sweet, it was fried. It was awful and awesome, all at once. I am not sad I did it, but I don't feel a need to eat it again any time soon. Or ever, really. Of course, there's more eye candy: here are some sweet snapshots of some of the sweet foodie things that were at the fair this year--be sure to visit next year to get in on the sweetness yourself! Visit thefair.com for more. I have also featured a couple of the fair's prizewinning recipes this week--for Maple Spam Doughnuts and tricked-out Banana Bread!